High Quality Construction - Our suture pad is made of durable silicone composite material with mesh between layers to reinforce and strengthen the 3 layers: skin, fat, and muscle to replicate the anatomical structure of human tissue and provide you a great opportunity to practice sutures and closure of differing techniques again and again. Multiple Wound Types - 14 wounds of 8 types with additional space for your own cuts, reinforced with mesh for durability. Realistic Practice Pad - Realistic Texture with a Variety of Wounds - our pad mimics human flesh, providing a near real-life (but much safer) opportunity to practice. Practice makes perfect! Practical Size - Dimensions of 7 inches (17.78 cm) by 5 inches (12.7 cm) - practical size for practicing as well as taking back and forth between lab and class. Sturdy Acrylic Base - Practice on a sturdy foundation without worrying if your pad is going to slip right in the middle of a closure - our base is made of high quality acrylic, unlike other bases made of cheap plastic, and is a better option than pads with no base. Please Note: Our Suture Practice Pad is for demonstration only by students and lifetime learners. Our suture practice pad comes with our money back guarantee. If the suture practice pad fails to live up to your expectations, simply return it for a full refund. 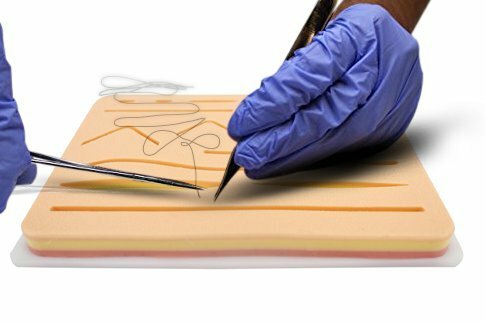 REALISTIC TRAINING PAD - our 3 layer suture practice pad imitates skin, fat, and muscles layers on a STURDY BASE with an assortment of pre-made wounds can be used multiple times for better practice of each suture technique. HIGH QUALITY DURABLE MATERIAL CAN BE USED OVER AND OVER - the durable silicone composite material with mesh between layers will not easily rip, separate, or tear so you can practice suturing the incisions again and again. PRACTICAL SIZE IS EASY TO CARRY AND PRACTICE ON - Dimensions of 7 inches by 5 inches provides enough space and wounds to practice on, but also can be packed and carried easily between class and home. ACRYLIC BASE PROVIDES A STURDY FOUNDATION - High quality (aka not cheap plastic) base is useful to create a foundation to practice your skills, and your pad won't slip around like pads lacking a base or pads with cheap plastic bases. MONEY BACK GUARANTEE - We are confident that you will have a great experience with this suture practice pad. If our suture practice pad fails to live up to your expectations, simply return it for a full refund. If you have any questions about this product by GSM Brands, contact us by completing and submitting the form below. If you are looking for a specif part number, please include it with your message.